Setting out cannon hygiene’s capabilities for the corporate market. A neeed to clarify their corporate message meant Cannon were losing opportunities to increase their business with larger corporate customers. Cannon Hygiene have a lot to talk about. Their services for medium to large corporate customers cover a wealth of functions: Washroom service contracts. Water and energy savings. Medical and dental waste disposal. Mats, floorcare services and more. They also champion sustainable practices and technology, a major selling point for organisations with high stakeholder expectations when it comes to corporate social responsibility. But their marketing effort was fragmented. Consisting of literature and PDF downloads that highlighted single-service stories at the expense of an overall, company-wide message, it did little to offer a ‘big picture’. As result, residual awareness of the Cannon offer among medium to large corporates was low, even among those who already used one or more of their services. More problematic, the Cannon field sales and telemarketing teams had no single piece of material or source of information they could draw on to educate and upsell prospective customers. • Field and telesales teams had a resource they could use to upsell existing Cannon customers to their wider services portfolio and convert prospective customers into new accounts. • Customers could be made aware of the Company’s Managed Corporate Account services, integrated approach to workplace hygiene and UK wide coverage. • Initiatives such as the Cannon Waste, Water & Energy project and 100% non-landfill targets received wider coverage. 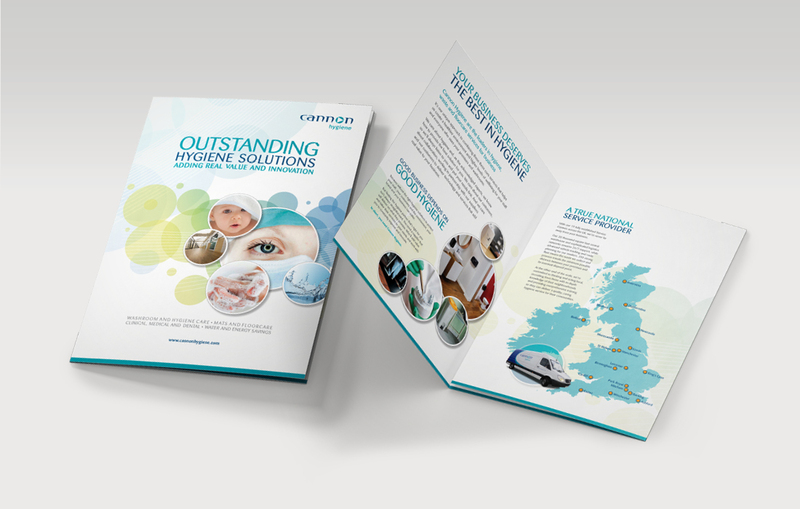 Our recommendation was for a concise, 6-page gatefold brochure that would summarise the Cannon Hygiene service story in an accessible ‘short read’ format. Based on established Cannon Hygiene brand guidelines, it followed the principle of ‘two-speed’ literature design: Clear, bold headlines and subheads to satisfy the skim reader, with more in-depth blocks of copy to reward those seeking further information. This offered a double advantage. First, it made it easier for Cannon sales personnel to use as a sales presenter during face to face meetings with potential clients. Second, it gave CRM teams something to mail out following phone calls with existing customers and new business prospects, or in response to information requests received on the Cannon Hygiene website. 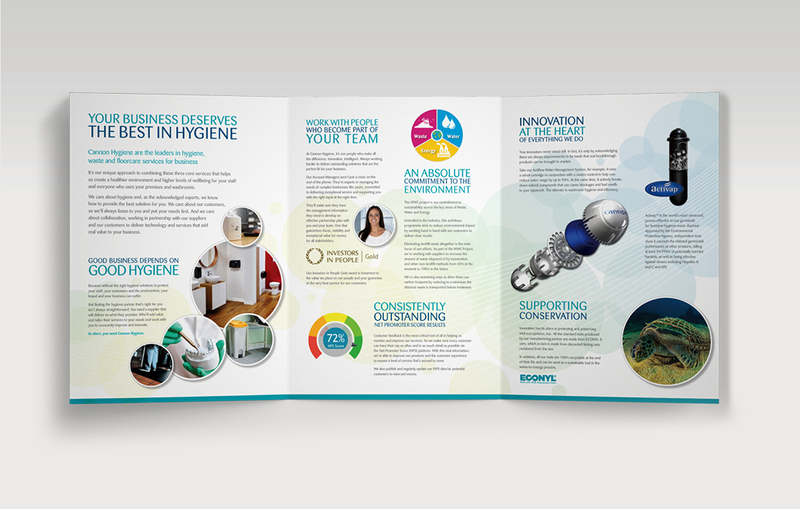 The Service Capabilities Brochure, as it came to be known, was well received both within Cannon Hygiene and among its target market of medium to large corporations. 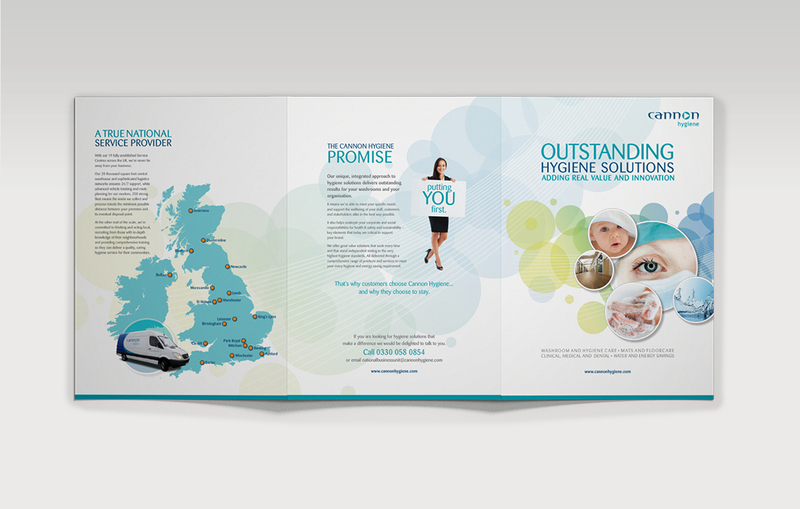 The new literature encapsulated the Cannon Hygiene story and played an integral part in supporting key business campaigns that then led to revenue generation. Proving that relevant information presenting a clear benefit at the right time will always have an impact on sales.